There is an event called Ride + Stride, organised by Gloucestershire Historic Churches Trust annually. It aims to raise money towards funds, to which churches can apply for grants to help in the maintenance of the building. This is the first year I had heard about it and, as it coincided with me recently saying I would organising a church bike ride, I decided to combine the two. Having worked out a route that visited all of the 8 CofE churches in Severnside Deanery, a small group of us duly set off on the 2nd Saturday in September. A fuller account can be viewed here. What a lovely route! Sooo well thought out and planned. The majority is on traffic-free cycle paths or really, really quiet lanes :-) ; very few (short) stretches on anything approaching busy roads. but they turned out not to be as bad as anticipated (I still did a deal of walking up them, though; which is my norm, anyway). For the most part, the signage was very good; but there were a few blips: when I found myself having gone round in a circle and would have continued to do so if I'd continued following the signs! And then there was a closed bridge and large detour with very poor information. But local people can be so incredibly helpful :-). I started off in Ravenglass, having had an almost stress-free train journey: Bristol - Birmingham - Carlisle - Ravengrass. Station staff and passengers were very helpful. I stayed overnight in a wonderful little B&B, Rosegarth, welcomed warmly by Chris, Hannah and the rest of the staff, plus the first of many lovely dogs. (I also encountered the most dog mess along the trip that I've seen for a long time :-( ). At Rosegarth there was locked storage for Raven (my bicycle). Before starting cycling, I spent my first morning taking a trip on the Ravenglass-Eskdale steam railway and meeting some of the committed volunteers who diligently look after the engines, station and passengers. Arriving back at lunchtime, I had a bowl of soup and then set off along Route 72 for the 174 miles to the other end. The route was along maintained cycle tracks, gridded beach cycleways, ultra quiet lanes. 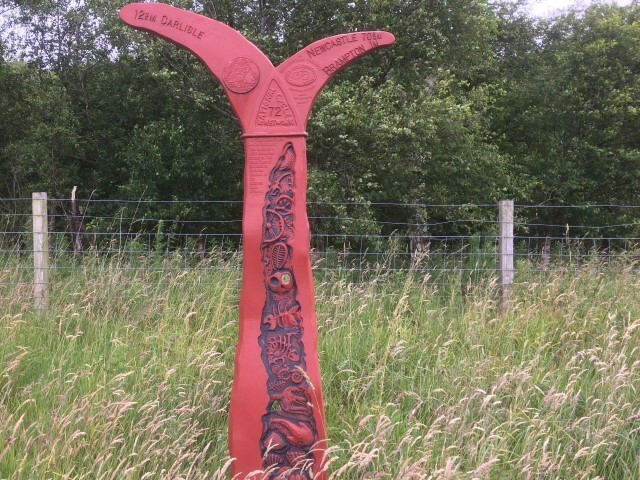 As I was heading for a campsite at St Bees, I came off Route 72 and followed a day trip route linking to 72. This took me along the sea shore and past Sellafield. During the night, there was a terrific thunderstorm: torrential rain, hugely windy, lightning and thunder! And my tent held good! The same tent I had on my trip 9 years previously. Whitehaven is another official start for the Hadrian's Wall Cycleway, from where many cyclists choose to set off. After a hilly start, the remainder of the day was mostly flat and picturesque along the Solway Firth. My second night was in Hillside Farm Bunkhouse in Boustead, just before Bowness-on-Solway. There was nowhere nearby to eat, but there was a mixture of free items (top shelf) and purchaseable tinned food (below shelves), in the kitchen of the bunkhouse. There were 2 lads staying there during the week, for work. As they were on night shifts, I had the whole place to myself for the night. 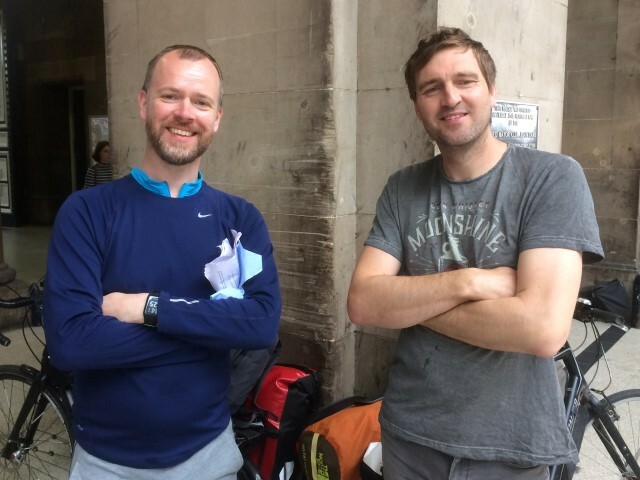 Yet another official start/end to Hadrian's Wall; this time for the walkers. Bowness-on-Solway (circular top of sign) points to Wallsend, Ravenglass and Rome itself. On the way to Carlisle were walkers galore and diverse (I keep thinking of them as pilgrims - underlined by encountering a couple of walkers from Czechia dressed in full pilgrim clothes). 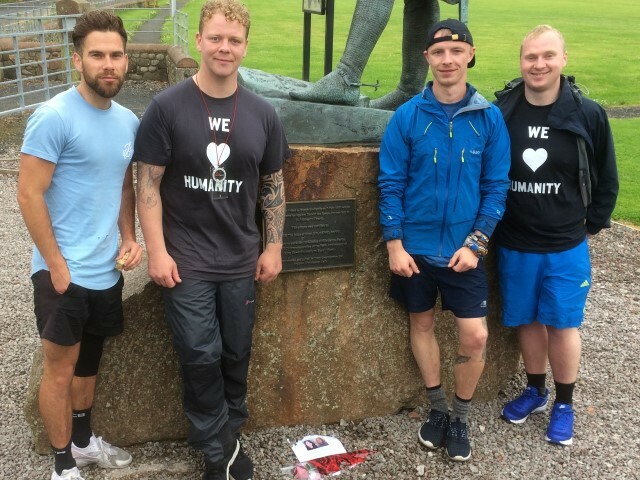 There were also a group of 4 lads walking in memory of a couple of girls killed in the Manchester bombing. I finally get to see the Wall - it does exist! This was on the day that was to be the most gruelling from the point-of-view of hills - but which turned out not to be quite as bad as anticipated. Still pretty tough, even so! The highest point of the route was scaled today - 256 metres - at Arbeia fort. Probably the most arduous part of the day was the last bit, getting to the campsite! 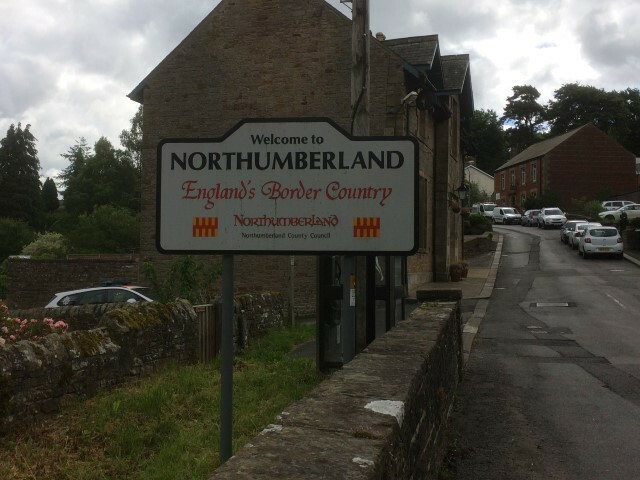 I'd made much better progress than I thought I would have done and reached Newbrough just after 2pm. There is a community bunkhouse there, but I could see no information at the Town Hall and nobody at the Red Lion next door knew anything about it. Coupled with the fact that I could get no food, as they'd just finished serving, and there wasn't much else going on in the village, I decided to continue to Hexham. Here, the B&B didn't reply when I tried phoning and the caravan park (marked on my map as a campsite) didn't take tents. 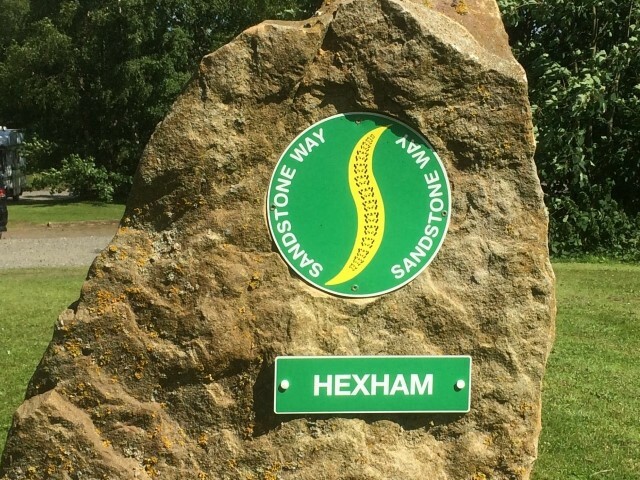 Which is how I found myself plodding up a steep, oh so steep, hill for a couple of miles to Fallowfield Dene campsite near Acombe, recommended by the cheery Helen from the caravan park. The final day of Route 72 had a bit of an uphill at the beginning, but then was flattish for the remainder, until a modicum of uphill towards the end at Tynemouth and South Shields. In a riverside park in Newcastle, there was a chap taking the sun lying on his recumbent. He gleefully extolled its virtues, particularly so for someone with disabilities from polio (which he has) or who has had a stroke (ie losing the use of one side of the body), mainly because it could be adapted for predominantly one-handed use. 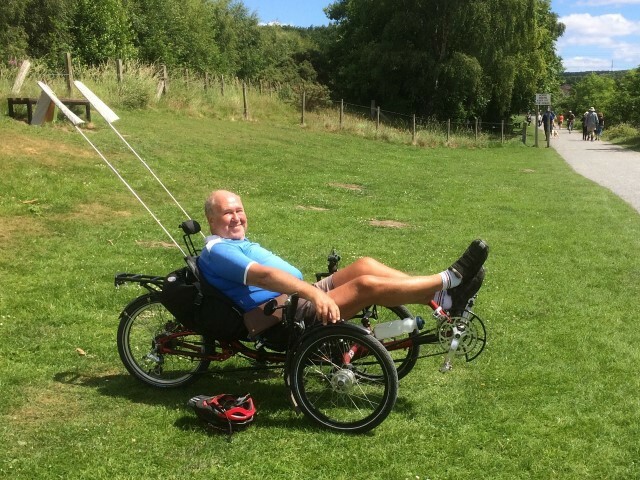 I also know it's good for people with bad backs, having met a couple in the US, whilst on my trip, who could only continue cycling because they were using recumbents and their backs could take that. I stayed in South Shields in a wonderful little guesthouse, Annie's, run singlehandedly by the amiable June. A couple of other cyclists arrived fairly late at the guest house, but managed to grab something to eat along the curry road in South Shields. 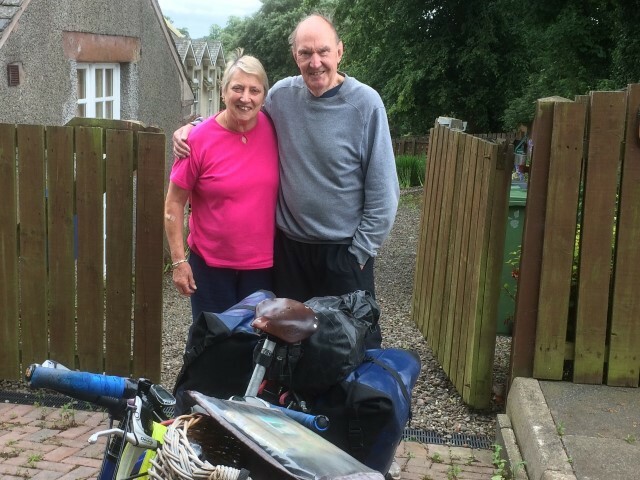 They'd also started from Ravenglass, taking 2 days (as opposed to my 3 1/2). Well, they were younger and fitter! On Monday morning, I found the official end/start to Route 72, south of the Tyne, at the Roman Fort. As I was leaving, the 2 lads from Annie's guesthouse came along. I then attempted to join Cycle Route 14 that follows the south side of the Tyne to Newcastle, but this wasn't obviously marked and it took quite a way along before I found it. It was pretty up and down-y and not as attractive as the 72, but eventually brought me to Newcastle (mostly away from busy roads, which makes such a huge difference to cycling enjoyment, as far as I'm concerned). Having arrived in the centre and had lunch in the cathedral cloisters cafe, the weather was pretty cold and grey and threatening rain and I didn't feel too enthused at staying on to do a spot of sightseeing, so when I discovered there was a train leaving in about 8 minutes, I decided to go for it. The 2 lads from Annie's guesthouse were on the platform waiting for their train home. Although it was a direct train to Bristol, it was 2 trains put together, due to split at Gloucester. There were 2 booked cyclists on the one; and, although there was also an unreserved cycle space, this was taken up by their baggage, which meant I had to get on the other train, the one that would not be going on to Bristol. However, it was only a half hour wait in Gloucester for the local train to come along. Whilst waiting, I got chatting to Chris, a railway minister, who spends his days travelling the trains and - well - ministering. Thinking that there was only the one stop to Bristol (because that's what it would have been with the Newcastle train) I automatically got off at the first stop - only to realise with alarm that it wasn't Bristol!! Back at Bristol Parkway and a short cycle ride home. And the fact that the rain held off! Despite the weather forecast, I had no rain whilst cycling, but a mixture of sunny and cloudy, with lots of threatening skies. Finally, I'm putting fingers to keys and writing an entry for this year! previous night, but was delayed due to adverse weather conditions. 8 February 2010. Momentous event over, we return to our beds. And I'm still selling my book, including through Waterstones, Cribbs Causeway, Bristol and online (hard copies and ebooks). As I mentioned in my last entry, I had toyed with the idea of a 10-year anniversary trip next year, 2018, but now it would seem most likely to be when I retire, ostensibly in 2022. In the meantime, I'll stick with shorter excursions. So, following on from the C2C Devon last year, I thought I might do C2C Cumbria this year. 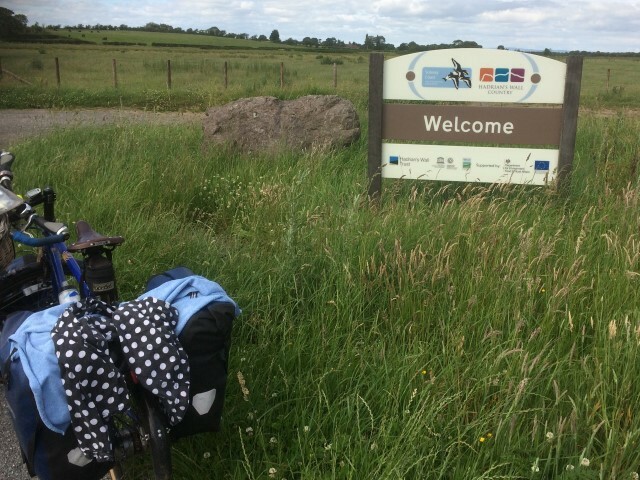 There are a few routes, but the one that appeals is the Hadrian Wall route (probably because it's desctribed as a family route - ie predominantly flat! But, having felt I'd been misled with a similar description of the Devon route, I'm rather dubious that it will pan out as expected). Depending on how I get on, I thought I'd then cycle down to Hull, as City of Culture. Having acquired a Senior railcard earlier this year (there are some advantages to being 60), it seems prudent to use the train either end of the trip. Yeah, yeah, it's all well and good having plans, but the testing thing is whether or not I carry them out. :-) I'd better start getting back on my bike, then, and getting my legs going again - they certainly need it!